If you've read our review of Intel's new desktop Sandy Bridge processors, you'll know they're bonkers quick. But you'll also be aware that Intel's latest processor architecture is arguably more about mobile. On paper, the Sandy Bridge architecture looks purpose built to drop into laptop PCs. It's Intel's first chip with processor cores and high performance graphics on the same slice of silicon – it's almost a system on a chip. Sandy Bridge is also based on Intel's latest 32nm production node and packs promising new features such as the Quick Sync Video encoder and AVX instruction extensions. Put it all together and you have a recipe for what could be immense mobile performance combined with better than ever power consumption. Happily, we can bring you some hard numbers regarding the first half of that equation. Intel let us loose in its labs with an early Sandy Bridge mobile evaluation platform. It's representative in terms of performance, but we'll have to wait just a week or two longer for a retail system our first glimpse of just how good Sandy Bridge's battery life will be. Our sample Sandy Bridge notebook is running the Core i7-2820QM. That's a quad-core chip with an advertised frequency of 2.3GHz. As we'll see, that latter number doesn't mean much due to the aggressive implementation of Turbo Boost in the latest Sandy Bridge processors. For comparison we have both a dual-core Core i5-540M and a quad-core Core i7-740QM from Intel's existing mobile CPU line up. Out of the gate, the new quad-core Sandy Bridge chip blows away the previous generation processors in the Cinebench R10 software rendering test. The new 2820QM clocks a time of just 47 seconds to the one minute and 27 seconds of the quad-core 740QM and one minute 42 seconds for the 540M dualie. It's a similar story in the x264 HD video encode test, the new Sandy Bridger hitting 28.4 frames per second to the 740QM's 16.4fps and 12.7fps for the 540M. If you're wondering where the performance boost is coming from, much of it is thanks to Turbo Boost 20. With all four cores active, and even running inside a thermally suboptimal development chassis, the new 2820QM runs at between 2.8GHz and 3.0GHz. Of course, Sandy Bridge has that funky Quick Sync Video transcode engine so the gap with supporting encode software will be even bigger. Arguably just as interesting is the performance of the new Intel HD Graphics video core. All the new Sandy Bridge mobile chips get the full 12-processor HD Graphics 3000 version. The direct comparison here is with the 540M, since the 740QM lacks integrated graphics. Anyhow, the shizzle here is 27fps for the new Sandy Bridge graphics compared to 15fps for the 540M in Call of Duty 4 at high detail and 1280 x 800 resolution. Actually, the number for the Sandy Bridge is a little lower than we expected. But we anticipate slightly better performance from final retail laptops. If that's a sneak peak at the performance of the new Sandy Bridge processors, the elephant still standing is battery life. On paper, the new Core i7-2820QM doesn't look like a big step forward by this metric. After all, it has the same 45W TDP as existing quad-core mobile Intel processors. In fact, none of the new mobile Sandy quads is rated below 45W. However, Intel's TDPs are only rough guides. 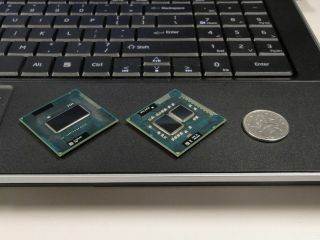 What's more, the new graphics core of the Sandy Bridge chips must fit inside that TDP. Existing Intel mobile quads contain only CPU cores. All of which means we're hopefully for some serious progress. With any luck quad-core might just be the new dual-core.